As a goal, the 18 peak award didn't inspire me. I don't mean to say that climbing "the 18" isn't an accomplishment, I'm simply not motivated by lists. As it turned out, the mountain I wanted to climb most, Shuksan, turned out to be my last of the 18. Hmmm... I'm certainly not trying to discount the award but it had a different affect on me. When I received the award, I looked down all of the peaks and I wasn't impressed that I had climbed them. When I looked at each peak, I saw the faces of my climb teams. My first peak, I only knew Amy. I look back at the team and now I count many of the people on that first climb as my friends. People who I could turn to if I was in need. People who can count on me for whatever. Climbing is more than climbing. I'll do my best to let the picks do the talking but as you know, its hard for me to keep quiet. On our Olympus trip, a girl from a Mazama team injured her ankle on the hike out. Steve made her a crutch! The climbing world is a small world. The girl who injured her ankle actually broke her ankle and four years later, I've gotten to be friends with her and her husband. The mountain was beatiful but I remember the people. I've always felt that hobbies are good but they are nothing more than stuff that we do w/ our friends and family. 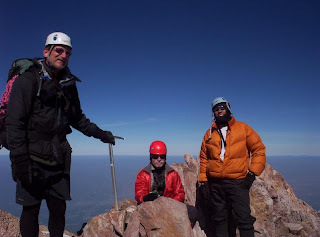 Here Tim and I enjoy the summit of Mt Shasta. I know we have the same look but it's easy to recognize Tim by his pink bottle. I've only had three or four opportunities to climb with Jay but he's inpired me. He was known to climb Hood monthly. As the legend goes, he climbs Hood for breakfast and Adams for dinner. I've seen him eat and I believe it. On one of my first climbs, S Sister, Jay was leading us up the snow field. I had this ole guy slowly kicking steps up the final snow pitch. He was going slow so I offered to relieve him. He declined and mentioned that he's happy w/ the pace. I figured he was red lining and he was going to have himself a heart attack. As I found out, he could run circles around me. He was just humble. Ellen Gradison, where to start! I can't really get into all of the ways in which Ellen has inspired me. Instead I'll show you this pic on the summit of 3 Finger Jack. She got to the summit first and she set up the anchor. It was very breezy. Since I was going to be back at the saddle I left her my jacket. It fit her like a dress. More on Ellen later. Here, Tim Hale is perched on a sub-ridge of 3FJ. I couldn't resist working this pic in. John and Glo. At the gear swap, I met John and Gloria. Amy bought Glo's old pack and John invited Amy and I to join his Mt Hood climb. It was his provisional year. I let my glove fly off the triangle moraine and almost froze my hand off. Thanks John. When I took climb school, I didn't plan on sticking with the club. I just wanted to learn the basics. People like John and Glo got us hooked. I can't say how many trips I've gone on w/ these two, nor can I say how many times we've had dinner with them. But I can say this, they're people who I've looked to for advice on tents and life in general. They don't come better. Is that a sweet beard or what! Matt Vancampen lead a trip up the Whitewater Glacier on Jefferson. I also had the chance to climb w/ Matt down in S Oregon this summer, it was one of the best trips I had all year. I respect all of the climb leaders in our club for their ability to lead climbs. When it come to Vancampen, I hope someday I can be half the man he is. He's doing the important stuff, while I'm fooling around in the mountains. Here's the infamous traverse on Jefferson. I believe there were 9 of us on this climb. I'd say 8 of them have become my good friends. The other lives in Virginia. Here, the true mountain man Keith and his squeeze Linda take in the view. Glacier Peak has become an illusive peak due to road washouts. As it turned out, we spent 5 days doing a roundabout route. It might be the most beautiful area I've been. I can't talk about my friends in the club w/out bringing up Robyn Smith. I've likely done more trips with Robyn than any other Chemeketan. Certainly some of the most memorable trips were with Robyn. Tim and Robyn were as encouraging to Amy and I our first year as anybody. 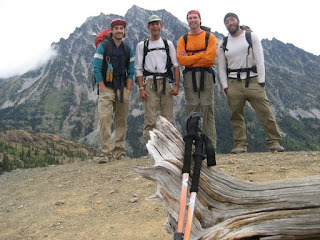 That same Glorious trip on Glacier Peak. Here, Big John and I stand on the summit of Baker w/ Shuksan in the background. This was one of my provisional leads. I used to look at pictures like this and think that was a life for other people. 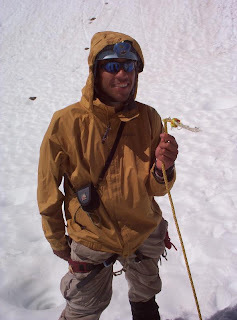 On that same trip, Steve lead a different team up the other side of the mountain and we all converged at the summit. We also ran into Vincent and a couple of other friends from the Mazi's. In the pic, you can see Steve and you can sort of see Linda in her party hat, it was their 18th peak. Tons of fun on a perfect day! I wasn't ever itching to climb Mt Rainier. Big John some how convinced Amy that she could and should climb Rainier. They dragged me along. This pic was on the decent of Dissapointment Cleaver. Looking back down the heavily crevassed glacier Amy saw a boot path going through some wild terrain. "Look," she said, "some idiots walked through all of those crevasses!" Her mouth gaped when we explained to her that we were the idiots who walked through the crevasse field, it was just dark and now we had to go back through in the day light. From our Rainier team, I think I've climbed w/ 8 out of 9 of the members around a dozen times each at least. 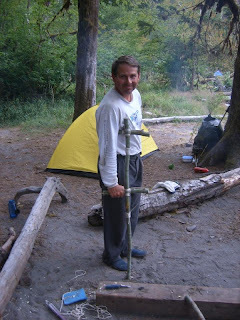 I was at the end of Rick Barry's rope team when I had one of my strangest climbing moments. John led his group of 5 into an ice fall. All of their had lamps dissappeared. Rick followed them in and both of our rope teams, aside from me, were in the icefall. I couldn't see a single headlamp. It was black and I was alone on the mountain. Before I turned the corner into the maze, I saw John's headlamp peak out the other side. I chronicled our voyage up Mt Shuksan on a separate post that most of you have read. I've always done my best to learn the newest techniques and be progressive in my learning. I try to focus 100% on the micro and 100% the macro. 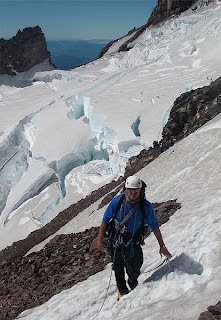 On Shuksan, I had to micro focus on the wet/icy downsloping rock while leading the pitches. If I let my weight shift and had a foot slide out, it would have been bad news for the team. At the same moment, I had to focus on the macro scale of how will the rest of the team handle the moves and will I be able to find a suitable anchor and am I going the best way? Am I keeping track of time? Mt Shuksan was my 18th peak and likely my best effort as a club climb leader. Our team overcame challenges and we stayed out of harms way. What will I remember most from that climb? Was it the pitches? the views? the sigh of relief when we were down? Nah, I'll remember my friends. I'll remember a certain someone sprinting across the glacier, dropping their pants headed to the latrine. I'll remember Dan Sewell explaining to me how his misery index is around eight or nine when he was putting on his wet boots. I'll remember splitting pizza with Tim and Jade and all of us trying to finish the one we were working on so we can snag the last peice. (but acting like we don't know there's only one peice left) I'll remember Bryon anchoring his rope team wearing an ace bandage around his face because he forgot his sunglasses. I'll remember John and Joanna posing for a picture in the starbuck parking lot, looking like tourists. I'll remember the look on Mike McHugh's face in his summit shot. But there's certainly more than just 18 peaks right? In this pic; Ellen, Amy and Melissa Heuberger (now Melissa Nisly) are hanging out on the Tatoosh Traverse. This was one of the more formative climbs I've been on. The Tatoosh should be the graduation climb from climb school. You get to use all of your new skills in a beautiful area in the back drop of Rainier. On this climb, Amy learned that climbing is fun. Up to this point, the few climbs we'd gone on were more about being cold and walking in the dark. Ellen sent out an email to the new climb school grads giving us some options of things she was willing to lead. Ryan Nisly, Melissa, Greg Phillips, Amy and I picked the Tatoosh. Seeing Ellen's patience and her ability to encourage are skills I strive for. Last weekend, we met up w/ Ryan and Melissa and the Sewell's to make apple cider and I had another chance to see that climbing isn't always about climbing. My third climb was up Snowking Mountain in the N Cascades. Haydar Kutuk took us on a Bill Saur Special; climbs where the approach is the hard part. Haydar and Bill taught me to enjoy all of the mountains. Not just the ones on the list. Joanna asked Haydar how many of the 18 peaks he had left to do, I think Haydar said 16 more and he'd be there. She asked what his goal was, he said his goal was to have fun. I've gotten my 18 peak award, it was mostly by default, when you climb every weekend, your gonna knock em off. I've never forgotten Haydar's answer. "My goal is to have fun." Wild Bill is known for his uniqueness. He finds the most obscure peaks and the most obscure web sites. He has the most clever sayings and he's not afraid to resort to plain old cursing. He has a way about him that makes you think your climbing w/ a madman but at the same time, you can see he's given things alot of thought and his experience shows through his madness. I've watched him tie himself in knots trying to clip through a picket as the middle person. On an all day trip to a place he's never been, I've seen him guestimate arrival times within five minutes. Every now and again, Bill will get serious and try and pass on experience. He's given me some of the best advice in climbing. "When you're climbing, the most important peak is the one your on, don't focus on future trips." On my second Chemektan trip, Vincent took me to Diamond Peak. There was 10 feet of snow on the trail and it rained for all but 8 hours on a three day trip. Vince gave me chances to lead the team up a steep snow ridge and planted the seed for leadership. He's always encouraged me and even threatened that he's passing the torch to me. I think he's got lots of miles left. The W Ridge of Mt Stuart was the first serious climb I went on. I had been cragging and I'd been mountaineering. It was my first alpine rock trip. I learned on this route the 5.7 alpine is no joke at all. I remember being in the middle of a lead and wishing I was hiking up the Cascadian because I was scared. I remember wishing the hard parts were behind me. Vince "let" me lead all of the pitches because he'd already done the route. This route got me into the idea of Alpinism. Finding alternate routes to the easy routes up mountains. Now, I love the feeling of having lots of rock to climb and not much time to do it. I love being in the middle of a hard lead. While in the middle of the difficulties, I often wish I was somewhere else, but I like that feeling too. I love pushing myself in the mountains and I enjoy showing beginners the "ropes." I climbed the 18 peaks and remember every person on every peak. I've climbed by myself and I've climbed in a "team" of 19. I can go to the mall and not see a single person I know, but on the summit of Mt Baker, I catch up w/ 16 of my close friends. I've been shaped by the leaders who taught me and the people who I've taught. No returns on the summits but I'll gladly buy the pack back!